Former Marine Sgt. Joe T. Charles says putting his war experiences on paper helps him cope with post-traumatic stress disorder. Charles is a counselor at the Chinle VA Center and helps his comrades deal with PTSD. "There's things that you just don't share with civilians, not even your spouse," said David Yazzie Jr., a Gulf War veteran and member of the Navajo Nation's only PTSD support group. Ruthie Hunter, a clinical social worker with the U.S. Veterans Administration, was hearing that a lot. So when she was assigned to work with veterans in her hometown of Chinle, she decided to give the vets a forum where they could talk about their experiences among other vets. When the Post Traumatic Stress Disorder Education and Support Group started meeting a little over a year ago, business was slow. "Sometimes one person would come, sometimes nobody would come," Hunter said. "I kept changing the day and time, hoping to come up with something that would work for more people." But eventually word spread. This past Tuesday, 14 PTSD sufferers met at the Chinle VA Center to hear about and discuss sleep disturbance. Each weekly meeting features a topic, ranging from anger management to numbing to startle response, but if the participants get off-track, that's fine. "I try to be flexible and go with what they want to talk about," Hunter said. She usually has an icebreaker - Tuesday they did the Hokey Pokey. "Sometimes we sing," said Iraq War veteran Joseph Jones. "Sometimes we pray." "Sometimes we cry together," added Vietnam vet Larry Brown. "Sometimes we laugh," said Yazzie. "That's the best." Mostly the participants - ranging from grizzled World War II ground troops to fresh-faced, troubled-eyed youths just home from Iraq - seem to like being in an environment where people know what they're talking about. "Sometimes your spouse will go, 'Get over it! Don't be a baby!'" said Iraq War veteran Joseph Jones, prompting nods and smiles from the other guys. "There's just no way to explain to them what you're dealing with." In this group, nobody has to explain anything. They've all been there. Post-traumatic stress disorder, first identified as a syndrome in the 1970s (though it certainly has existed as long as humans have), is a natural reaction to a traumatic event such as an accident, military combat or sexual abuse. Symptoms, which may surface years after the event and continue indefinitely, can include depression, isolation, anger, avoidance of feelings, nightmares, guilt, and anxiety. Not listed in the VA brochure on PTSD, but experienced by some of the veterans in the Tuesday group, is unexplained physical pain. After losing his daughter, Vietnam veteran Lloyd Yazzie started to feel a dull ache in his abdomen. "I went to three different hospitals," he recalled. "They did all kinds of tests. The doctors all told me there was nothing wrong with me." Finally, Yazzie ended up at the VA hospital in Prescott, Ariz., where a doctor told him the pain could be a manifestation of post-traumatic combat stress, long buried but brought to the surface by the strong feelings involved with losing a child. "I didn't know nothing about PTSD," Yazzie said. "But when he described it, it made sense." Psychologically speaking, life had kicked Yazzie in the gut. Sure enough, when he started getting treatment for his mental symptoms, the physical pain eased. 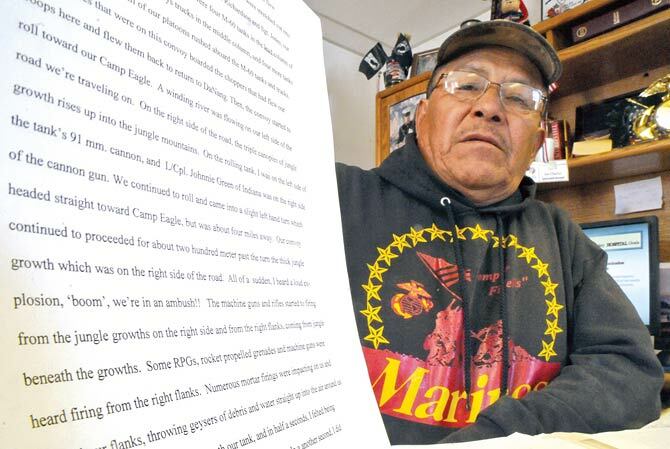 Since PTSD manifests differently in each person, sharing experiences like Yazzie's is a way to help each other, said Vietnam veteran Herman Leonard. "I first came to the group because they invited me to offer a prayer," he said. "But when I started listening to these guys, I realized I was going through a lot of the same things." Added Brown, "I come to the group for healing. But I also hope some of what I say can help heal the young ones." "When the elders in this group talk, I listen," he said. "Somehow they've found a way to get through it all." The younger vets have the advantage of at least having heard of PTSD. When the Vietnam vets came home, in some cases to boos and catcalls, they were alone with their symptoms, said Don Bizardi. Bizardi fought sleeplessness and isolation for 20 years, at one time moving into a separate house on his family compound because "I just didn't want anyone to bother me." Fortunately, his wife stuck it out, and together the couple sought treatment. "I was lucky to have an understanding wife," Bizardi said. "A lot of the guys who show up here weren't so lucky." Indeed, divorce is such a common result of PTSD, it could almost be called a symptom. The veterans who went through it seem sympathetic to their exes - it's not easy to live with someone prone to bursts of anger, or who might reflexively fling a wrist across your face if you startle him from sleep. Hunter has been offering a support group for spouses and significant others of PTSD sufferers, but so far no one has shown up. "I still think there's a need for it, after listening to these guys," she said. Anyone interested in such a group may call her 928-674-3682. While the Chinle group is not the only PTSD support group in the area, it is at the moment the only one on the reservation. Tuesday's session attracted participants from as far away as Shiprock. Two men from the north said they're hoping to start a group in the Northern Agency. They'd been attending a mostly Anglo group in Farmington where they felt hesitant to talk about Navajo spirituality. The spiritual ills associated with combat have long been known to the Diné, who developed the 'Anaa'jí (Enemy Way) and other ceremonies to deal with it. Several veterans in the group said they combine Western therapies with Native healing, and in the all-Navajo Chinle group, aspects of both Christian and Native spirituality frequently come up. In Tuesday's session, for example, one topic of discussion was the spiritual merits of drinking spring water as opposed to buying water in plastic bottles. Both local pastors and medicine men are frequently invited to lead the group in prayer, and the vets seem to respect each other's spirituality even though spiritual views vary widely within the group. Mostly, the veterans keep coming because the group works. "When I leave this room," said Brown, "I go home a better father and grandfather - a better man." The Chinle PTSD group meets Tuesdays at 10 a.m. at the local VA Center on the old BIA compound. The next few weeks will focus on the topics of grief and loss, which can trigger post-traumatic stress as in Yazzie's case. All veterans enrolled with the VA are welcome. Hunter is starting a similar group in Piñon, Ariz., Wednesdays at 10 a.m., and may soon offer one on Hopi as well. The VA office in Fort Defiance is also starting a group. Information: Chinle VA Center, 928-674-3682; or the Northern Arizona VA Health Care System at 1-800-949-1005.